Unlike any film of its time – horror or otherwise – Henry: Portrait of a Serial Killer depicts an unforgivingly realistic portrayal of evil. 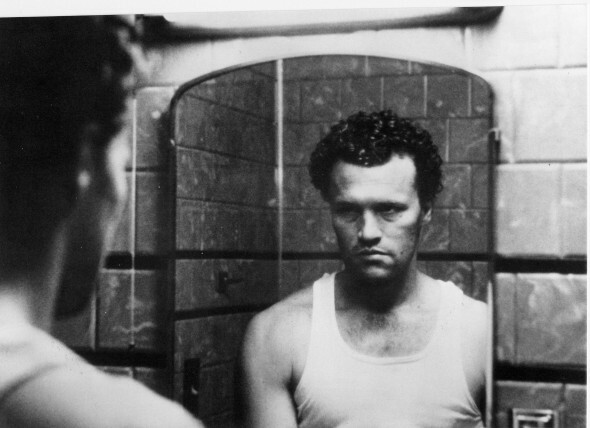 A deeply disturbing Michael Rooker plays serial killer Henry (based on real-life murderer Henry Lee Lucas). We follow him through his humdrum days of stalking and then dispatching his prey, until he finds his own unwholesome kind of family in the form of prison buddy Otis (Tom Towles) and Otis’s sister Becky (Tracy Arnold). Director John McNaughton’s picture offers a uniquely unemotional telling – no swelling strings to warn us danger is afoot and no hero to speak of to balance the ugliness. He confuses viewers because the characters you identify with are evil. Even when you think you might be seeing this to understand the origins of the ugliness, he pulls the rug out from under you again by creating an untrustworthy narrative voice. His film is so nonjudgmental, so flatly unemotional, that it’s honestly hard to watch. What’s diabolically fascinating, though, is the workaday, white trash camaraderie of the psychopath relationship in this film, and the grey areas where one crazy killer feels the other has crossed some line of decency. Rooker’s performance unsettles to the bone, flashing glimpses of an almost sympathetic beast now and again, but there’s never a question that he will do the worst things every time, more out of boredom than anything. Re-released in time for its 30th anniversary with a 4K scan and restoration from its original 16mm camera negatives, Henry now boasts an even grittier, more unseemly quality. The world McNaughton invites you into feels even more alien and yet lived-in – a world you never imagined existed, but one that feels so authentic you’ll truly believe it does. This is horror. You should see this. Oh No! There Goes Tokyo!